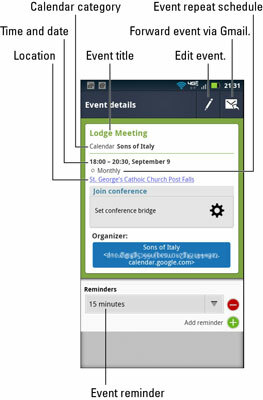 To see all upcoming events, choose Agenda from the View button’s menu (refer to this figure). Rather than list a traditional calendar, the Agenda screen lists only those dates with events and the events themselves. To see more detail about an event, touch it. Details about the event appear similarly to the ones shown in this figure. Not every event has the level of detail shown. The minimum amount of information necessary for an event is a name and the date and time. Touching a location, as shown, conjures up the Maps app where you see the event’s location on the map. From there it’s easy to get directions. You can return to the Month view at any time by touching the View button and choosing Month. Or hop quickly to today’s date by choosing the command Show Today from the View button. 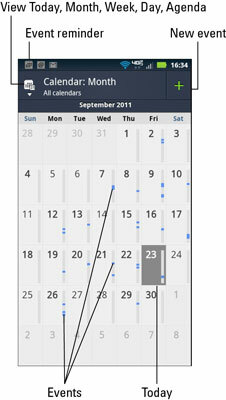 Use Month view to see an overview of what’s going on, but use Week or Day view to see your appointments. Check Week view at the start of the week to remind me of what’s coming up. Events on the Calendar are color-coded, which not only helps you organize events but also show and hide different types of events. To control the colors and event categories in the Calendar app, press the Menu soft button and choose Settings and then Manage Calendars. Use your finger to flick the Week and Day views up or down to see your entire schedule, from midnight to midnight. Navigate the days, weeks, or months by flicking the screen with your finger. Months scroll up and down; weeks and days scroll from left to right. To go to a specific date, press the Menu soft button and choose the Go to Date command. Use the onscreen gizmo to enter a date and touch the Go button.